ZK 6.5 introduces new features that enable developers to design user interfaces that take advantage of tablet-specific user interaction methods such as swiping and changing device orientations. You can also view the blog here. The timeline below shows ZK and our history. For more information please take a look at our about page. We have just released a new tutorial named "Practices Of Using CDI In ZK". This tutorial introduces developers to some programming practices of each layer in CDI & possible solutions for common scenarios. For the article, please click here. 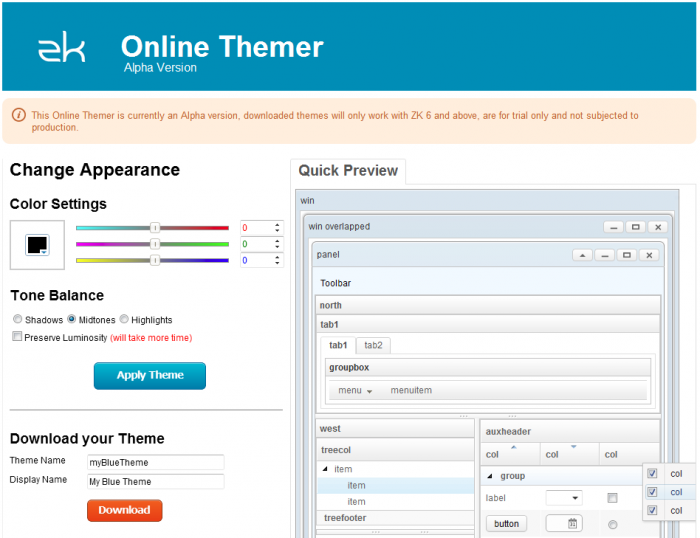 ZK has released an Online Themer to help you create different themes & colours for your ZK application in just a few clicks! You can try now by clicking here.